Happy Leap Day everyone! I wish I could say that I am doing something special today, but I am just doing my regular Wednesday stuff. Anyone doing anything special today? Speaking of my normal routine... Finishing up projects around the house seems to be a constant part of my life. Starting projects is really fun and easy, but finishing up the little details always seems to take me a long time. 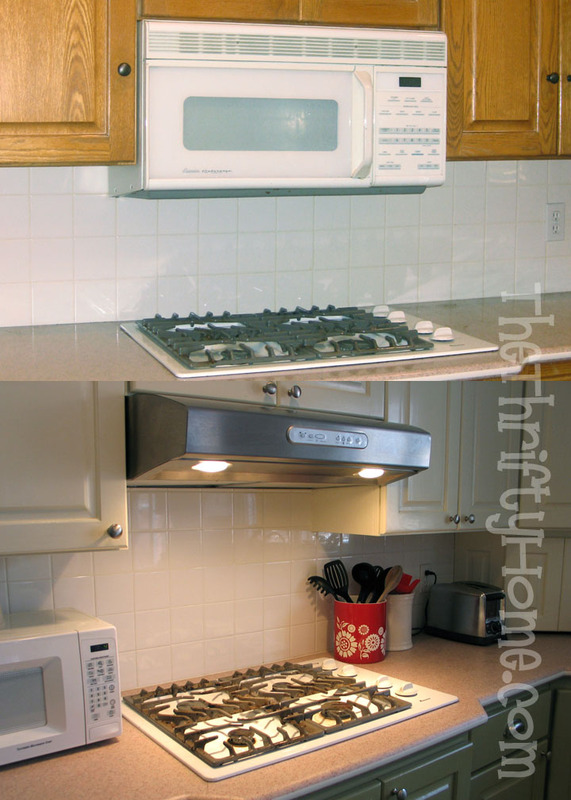 Back in July we painted our kitchen cabinets and took out the built-in microwave and replaced it with a stainless steel hood. The problem is that there was some missing tile where the microwave was. We did the big and hard part of the project and only just now finished up the details and put in some tile. We also cleaned up the grout in the backsplash with a nifty grout pen. This month I also created a Pinterest account and have wasted way too much time there. It has replaced my binder full of cut-up magazine photos and articles of projects and decorating ideas. Click on the button below to follow me on Pinterest. I can't wait to see what you have all been up to and maybe I will even pin some of your thrifty ideas on Pinterest. Your hood looks great! I may do this in my kitchen ...LOL. A project now going on a year long! That just means that you have to link back to my blog either on your post or somewhere else in your blog. You can grab my button on the side of my blog or just leave a small link in your post. Today, I linked up my Cheap, Organic Face Wash recipe. It ends up costing less than $.01 per use and is super easy to make! Thanks for hosting again this week. I love to find other crafts and projects I can do on the cheap! Thanks for hosting! I love Pinterest! I used it to help me plan my daughter's birthday party in December, and now I'm using it to plan a First Communion Party.